Death and taxes are a certainty and from a financial perspective, it's important to plan ahead for both. According to Parting.com, the average funeral costs between $7,000 and $10,000. A funeral with cremation, rather than burial, is slightly less expensive, with a median cost of $6,260, according to the National Funeral Directors Association. Funeral costs can create a financial burden for your loved ones if they're not prepared to pay for them. Establishing a funeral plan that takes into the financial side of things can make the process less stressful for them to deal with. If you haven't given much thought to your funeral plan, you might be surprised to learn how much goes into it. For instance, you'll need to decide whether you'd like to be buried, interred in a crypt or cremated. If you're seeking a burial or interment, you'll have to decide where that will take place and what type of casket you'd like to have. With cremation, you should also consider how your remains will be stored. You'll also need to give thought to what kind of funeral service you'd like to have and where it will be held. For instance, you may want to go the more traditional route and have a small service at your church or at a funeral home. Or, you may want your loved ones to gather together for a celebration of your life at a memorial party to counter the somber nature of the event. Thinking about these types of things may be overwhelming and even seem a bit morbid but creating a funeral plan in advance can ensure that your funeral reflects your personal wishes without adding any additional emotion strain for the people you leave behind. It also gives you the opportunity to account for specific costs, create a funeral budget and determine how those expenses will be paid for. How much you budget for your funeral ultimately hinges on what you've envisioned for your plan. A good way to shape your budget is to consider individual funeral plan costs. Costs can vary widely, depending on the funeral home you choose. These figures don't take into account the burial plot itself or a headstone. A plot can run $1,000 to $2,000 to secure and prepare for burial. A gravestone can average $1,500 to $2,000, with prices increasing for more elaborate gravestones. Your budget should reflect what you can reasonably afford to spend, based on your expectations for your funeral. And if you're married, you should also be creating a separate budget for your spouse to ensure that neither of you is left unprepared by the other's passing. Many funeral homes now allow you to prepay your funeral expenses. The advantage of doing so is that you can cover these expenses while you're still alive, leaving no funeral debt for your loved ones to worry about. And, if you pay ahead, you can lock in the price of the funeral, cutting out the risk of prices rising due to inflation. But, prepaying funeral expenses isn't without some downsides. First, the money that you're using to prepay could be put to better use by being invested or saved elsewhere. Let's say you're 40 years old and you plan to spend $10,000 on a funeral. You expect to live to at least age 80. If you put that $10,000 in a brokerage account instead, earning a 6 percent annual rate of return, that $10,000 would grow to more than $100,000 through the power of compound interest. Prepaying can also be problematic if you decide to relocate later in life, or if the funeral home goes out of business. In the former scenario, your family members might then be responsible for paying transportation and travel costs to have the funeral where you initially arranged it. And if a funeral home goes bust, you may have difficulty recovering the money you've spent. Life insurance can provide financial security for your loved ones and a small policy can be earmarked specifically for funeral expenses. If you're planning to use life insurance in your funeral plan, you'll want to get a permanent policy, rather than a term life policy. Permanent policies cover you for your entire lifetime, whereas term policies only cover you for a set term. With a permanent policy, you wouldn't have to worry about outliving your coverage. Another benefit of permanent policies is the ability to accumulate cash value in the policy. Whole life and universal life, for instance, both have a cash value component. Depending on the policy, this cash value grows in a savings or investment account and this growth is generally tax-free. 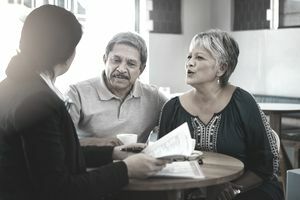 You're getting the dual benefit of earning a return on your investment, while also securing your financial funeral plan when it's time for your beneficiaries to claim the policy's death benefit. If you have sufficient life insurance coverage and you don't want to prepay, you can always use a regular savings account for funeral expenses. These accounts can earn interest, although typically at a lower rate than you'd get by investing the money. But, they're low-risk. If you want to earn higher rates and you're not concerned about needing the money right away, consider a certificate of deposit. CDs can earn higher rates and you can continue rolling the money until it's needed.